"The Best Value in Patagonia Running!" Join us for our LAST Patagonia Running Adventure! Contact us for the updated itinerary! All-inclusive prices include international flights from Los Angeles or Miami and ALL flights in Patagonia, ground transportation in Chile and Argentina; hotels, shelters; and all meals. See details in itinerary. Without a doubt the best value in a Patagonia running adventure. See our What's Included Checklist and compare! Including ground transportation in Chile and Argentina; hotels, shelters; and all meals. See detailed 17 day itinerary for complete information. Patagonia is a vast land of spectacular beauty. Southern Chile and Argentina share endless pampas, dense evergreen southern beech forests, sparkling turquoise lakes, abundant wildlife, immense glaciers and dramatic landscape with impressive pink, white and red granite towers. This running adventure combines trails in three National Parks — Torres del Paine National Park, Los Glaciares National Park, and Tierra del Fuego National Park. We begin with a run of the complete circuit of Torres del Paine National Park in Chile (UNESCO World Heritage site since 1979), where we will run among its renowned towers and horns. We drive across the border to Argentina and after a visit to the advancing Perito Moreno Glacier, we continue with our running in Los Glaciares National Park in Argentina. There we will enjoy views of the famous granite massifs of Fitzroy (11,289’) and Cerro Torre (10,265’). We fly farther south to continue our running adventure with a circuit around Tierra del Fuego National Park. Prior to returning home we will visit the cosmopolitan city of Buenos Aires. The Patagonia Running Adventure is held at the same time and overlaps much of the itinerary with the Patagonia Hiking Adventure. It is possible for one person to participate in the Running Adventure and another in the Hiking Adventure and spend every night together. If you choose this option, you can sleep all nights at the same lodges, except for 3 nights on the Torres del Paine portion of the trip. There is no additional charge, as long as you let use know in advance. For the rest of the trip you can follow either the Hiking or Running Itinerary. 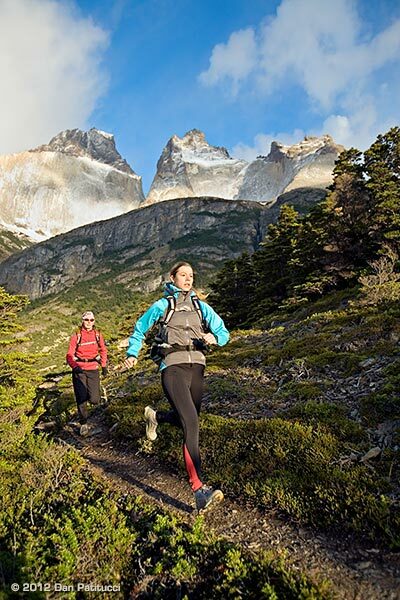 In Torres del Paine the running itinerary includes one difficult day. If desired, runners may skip this long and difficult segment and follow the trekking itinerary. Runners have the option of running shorter distances on all other days as well. We can accommodate your choice! Check with us for details! 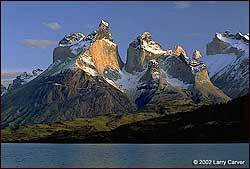 • Explore Torres del Paine, Los Glaciares and Tierra del Fuego National Parks. • View spectacular glacier-sculpted mountains, soaring granite towers, and turquoise blue lakes. 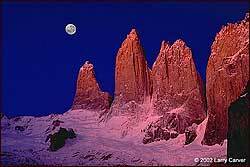 • Run to the base of the Towers of Paine, and Cerro Torre, and Fitzroy. • See Patagonian wildlife such as penguins, guanacos, flamingos, foxes, geese, and ñandus. • Stay in fine hotels 11 nights and comfortable mountain shelters (refugios) 3 nights  no camping! • Visit Punta Arenas, Ushuaia the “southernmost city in the world,” and the cosmopolitan capital of Argentina, Buenos Aires. This running adventure explores three National Parks in Patagonia: Torres del Paine, Parque los Glaciares and Tierra del Fuego. Runs are in mountainous terrain below 4,000 ft. Distances generally range from about 10.5 to 19 miles, with shorter options available on some days.